Japanese beetle adults are numerous throughout Illinois. Damage has been reported on linden, crabapple, and various other trees and shrubs. Heavy feeding is likely to continue until about mid-August. Japanese beetle adult damage on linden. The respite that we have had the last few years from Japanese beetle appears to have ended. Spotty heavy feeding damage is even being seen in east central Illinois where damage has been very low for many years. Droughts in 2012 and 2013 greatly reduced the number of larvae. Japanese beetle grubs require eleven inches of water from egg hatching in late July and early August until descending deeper into the soil for the winter in October and November. The season-long drought of 2012, and the drought from July into fall in 2013, caused high larval mortality. Most people allowed their turf to go brown and dormant those years, so irrigation water was not available to save the grubs. Japanese beetle larva in root zone cross section. 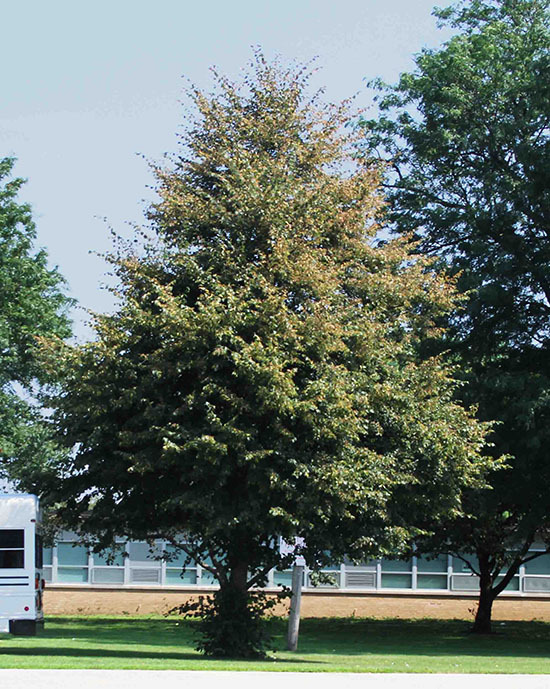 Cold weather during the winter of 2013-2014 resulted in an extended period of deeply frozen soils in the northern half of the state, causing additional Japanese beetle grub mortality. Unlike masked chafer grubs, which continue to tunnel deeper as soils cool, Japanese beetle grubs generally tunnel no deeper than eleven inches. 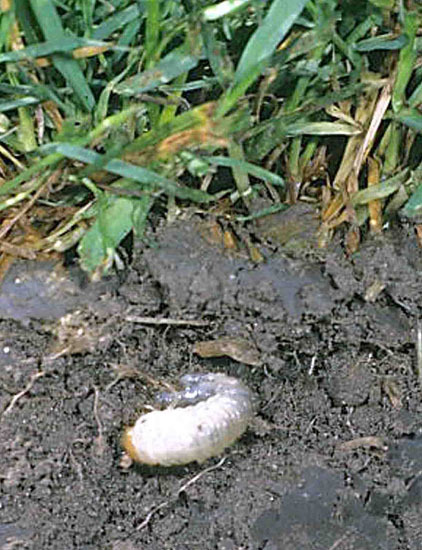 Although white grubs can tolerate freezing, they start to die after being frozen for three weeks.